In the first time I came the Northern of Vietnam was in a so busy business trips that I even had no time to relax. But in the final day when I was walking in Old Quarter of Hanoi to catch airport taxi, my step was attracted in front of an amazing video about Vietnam destinations. In the first sight, I just fell in love with Halong Bay and collapse in dream of escaping and enjoying the life I have wished. "Next time" I promised that with myself, but didn’t think that until 2 year later I just make it true. I decided to make my Halong Bay dream come true with my husband on our honeymoon, and he absolutely happy with that. I am the luckiest girl, right? But, the spectacular in every single inch of land along with the interesting hidden beauty that we were luckily found out in Halong Bay have not made my journey 100% perfect yet. 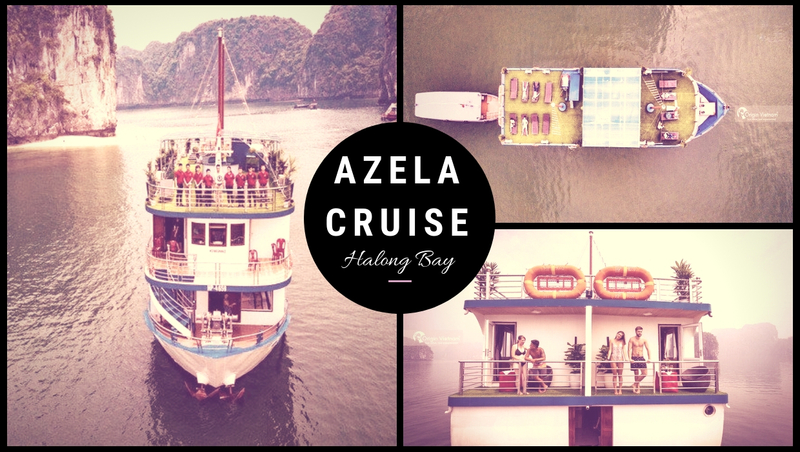 I thought it also depended a lot on the supports of Azela Cruise crew – One of the prides of Halong Bay Heritage. 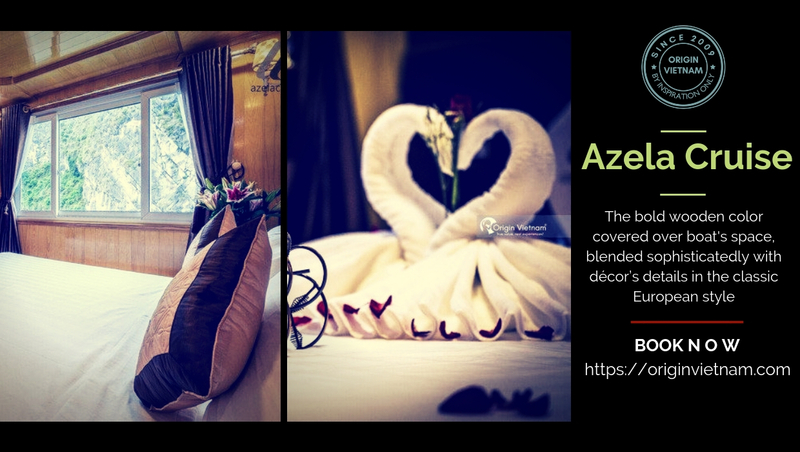 Just launched on 2018, in Azela Cruise having a kind of enthusiastic air that could warm all of further heart, satisfied all the young romantic soul, and liberate all the real feeling, made people enjoy completely freedom as they wish. When holding his hand tightly and put the first feet on boat, I could ensure that, this was the rightest decision I had made in my life. The heaven of love in the dreams we shared together, was Halong Bay. After four hours from morning on the shuttle bus from Old Quarter to Halong City, welcoming us in harbor was Trang – The Azela service team's captain. I really impressed by Trang's radiant smile, it looked alike a lucky sign for the whole of our upcoming journey. Azela is not big, it only have 10 cabins for small groups (families or couple were on honeymoon same us), going following Trang, we were joined in the introduce tour visiting around this amazing boat. Looks outside, this vessel is very simple and have no highlight, but inside it really is difference. The bold wooden color covered over boat's space, blended sophisticatedly with décor’s details in the classic European style. Specially the rustic essence of Vietnamese (as Trang introduced). Maybe I didn't understand all of Trang's words, but the deeply inside me, this designs really conquered my heart. Specially, the sundeck is the small garden with the soft grass carpet was covered full all corners. It looked so comfortable that you only want to be lay down and relax immediately. So that don’t be missed the airy air and the wonderful nature in Halong Bay. Our cabin was other amazing gift from heaven. It looks more alike a hill top house than the room on board. The opening – space with plenty of bright always is my favorite style. The curtains, the blankets, the lamp, the painting… all mix perfectly together with attractive brown oaks panels. The balcony with the green grasses carpet highlight in sunshine with view far away is the mighty karst top ranges raised from the sea in Halong Bay, really made me overwhelmed! Didn’t need talk about the architecture or designing, the high standard amenities in room was fully pleasured me. All things were in new generations and clean, I felt myself as a queen in that luxury life. But it didn't last too long, that was so pity. Pho, Sping Roll (Nem), Seafood, Grilled Meat (Squid/Fish) …was our most favorite taste of us. My husband is Pho holic, he can eat Pho three meals a day without laments. In the block of Azela gentle restaurants and bar lounge. It's lovely time becasue we always were served in hottest and freshest dishes whenever we felt hungry. Manh - A talented bartender with professional skills. Who always ready to bring you into color world of drinks, from cocktail, to smoothies, juice to tea and coffee. Enjoying meal and watching the movement of magic in nature of Halong Bay. It will be never is the bad choice for tourists when coming here. The afternoon of first day. Trang recommend us with a kayaking and swimming time on the Lan Ha Bay – the first stop of boat. Sitting with my husband on the kayak boat and rowing along the blue water line into the Dark and Bright cave. The filming destination of Kong skull island. It's exactly where to go in halong bay? Because where we have chance to see and touch the mighty karst mountains inside. The space around same as was froze, only us moved under the lane of water, enjoy the magic of nature. Finishing kayaking, I spent time together on beach to swimming. But my husband – the real adventurer, joined in the exciting snorkeling to go visiting amazing coral reefs with diving coach on Bay. The second day, after take hundreds pictures with the magical dawn. We spent time enjoying the hot coffee cup with delicious buffet breakfast in sharing room. Same as having the endless happy energy source, the Azela service staff always radiant and enthusiastic with all our requests. Because of them, Halong Bay quickly became as our second house, made us unwilling to leave. Halong Bay still have many others fantastic activity that we hadn’t had enough time to try. "The next time again" I promise, we will come back with our small family in longer time plan. Thank for Trang, Manh with entire of the staffs on Azela Cruise. That gave me the wonderful and safety voyage as today. The whole of time on Halong Bay, is the unforgettable memory that we will keep in our heart forever. Let connect Origin VietNam, the best agent of pride and trust in Halong Bay. Just only dial Hotline: Hotline: 8482 909 8686 or browse in website: https://originvietnam.com. You will be welcomed by the extensive knowledge consultant and professional team. With Origin Vietnam, you can assure about the most satisfied journey.